I have been involved in the horse industry for over 35 years. From purchasing my first trail/pleasure horse for personal enjoyment, to rodeoing, to barrel racing in the NBHA, to producing barrel races I have enjoyed being a part of it. My dream that I had as a small child of owning my own horse has been fulfilled. I started out with a grade horse that I had for the pleasure of weekend riding. 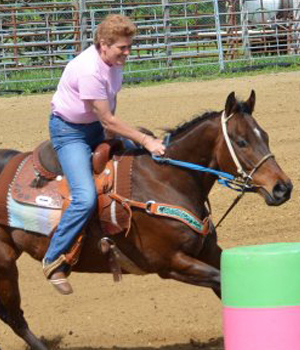 I then purchased my first barrel horse where the need for speed was met. I have owned several barrel horses throughout the last 25 years that I have been able to rodeo on. I was an active member of the Mid Atlantic Rodeo Assn, the Southern Rodeo Assn, and the International Pro Rodeo Assn, for several years, qualifying for finals several years. When the barrel horse industry added the 4D format for barrel races I became a member of the NBHA. This change has allowed for all horses regardless of speed to become marketable. It has also allowed for riders to become champions within the 2 second divisional brackets. I was a district director for the NBHA from 2007-2009. In 2011 I was offered and accepted the role of NC NBHA State Director. I hold that position today. I have organized and produced the NC NBHA State Finals each year where we have had record numbers of entries, added money, and prizes. Throughout the time of my involvement in horses I have been married to my husband of 26 years, had 1 daughter that has been actively involved in riding, and worked and retired from DuPont Chemical Company. I currently live in Cumberland County on 3.69 acres of land and house my horses here on my property.